Safety is one of the top priorities of a parent when choosing a car seat. With several models available on the market that is no easy choice to make. Who do you listen to? Your friends, your mother, the reviews online? We recommend collecting as many pieces of information as possible. A car seat is one of the most important investments to make for baby’s safety. 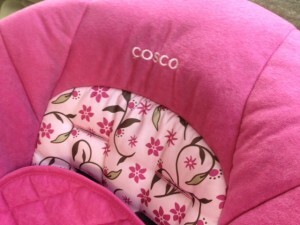 These photos show the Cosco car seat which was highly recommended by parent reviews on amazon.com as well as by the highly respected publication Consumer Reports. It is also helpful to talk with parents who have used a product for awhile rather than to someone who just purchased the product. Experience with a product over time may result in advice containing more pros and cons for your consideration. You may also want to ask the parent how the product suited the baby as she grew. Please choose your car seat with the consideration of baby’s development of bones and muscles. Today many car seats are on the market with little if any padding behind baby’s back. There may be padding under the hips and legs, but there may not be any padding under the back. It is extremely important to keep baby comfortable and cushion her developing bones and muscles. Try and purchase the product in a store or view one in person before ordering so you can take your hand and run it along the back of the seat. You should be able to push down and have the fabric spring back. If you push on it and you feel the hard plastic right under the thin layer of fabric then you know it is not soft enough for her to be comfortable. Occasionally the padding may be asymmetrical from right to left side, which may lead to asymmetry in the skeleton if baby spends enough time in the car seat. Once in a while a piece of one of the straps may get stuck under the padding and cause discomfort to baby. Take a moment every so often, specially if she is crying in the car seat, and run your hand along the padding to see if anything is poking up which may cause pain. 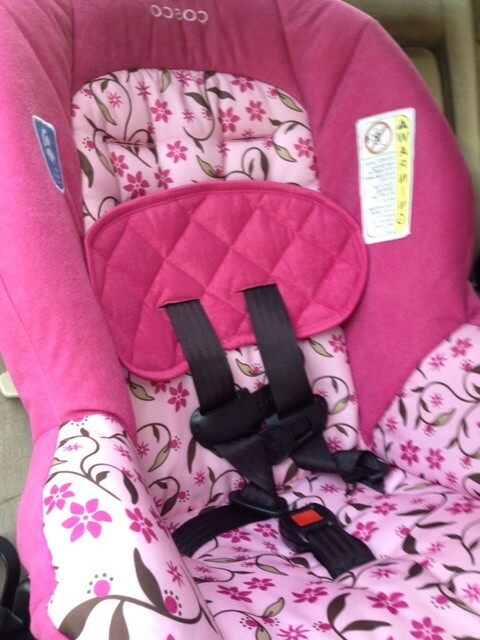 The above photo shows a well-padded portable car seat. Baby should be both comfortable and safe. This entry was posted in PRODUCTS & GEAR and tagged safety, support. Bookmark the permalink.